The potted plants need a lot of care and regular maintenance in the form of regular watering, nutrient supply in the form of fertilizer/manure/compost, pruning, etc and these activities should be taken care of regularly. One of the maintenance tasks that is very regularly ignored by most of us include what I call de-rooting (removing the excessive roots from the plant pots). As we all know that the plants have root systems that help it grow and absorb moisture and nutrients from the soil. 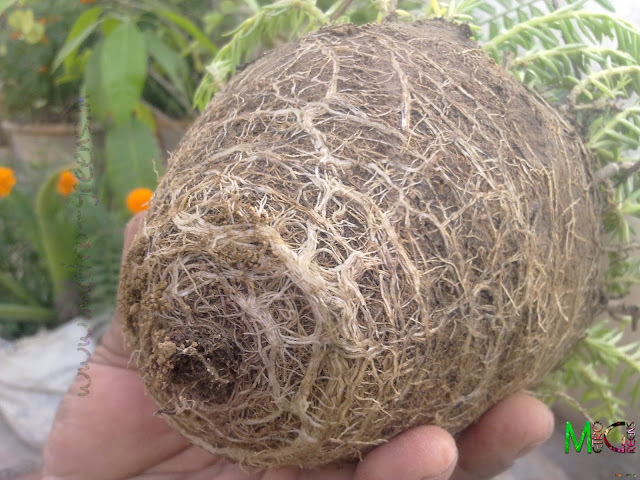 These root systems are in a continuous process of evaluation over time and thus have the tendency to grow into quite a dense network. I have seen many of my plants having generated very dense "webs" of these roots, which appear like a bird's nest. 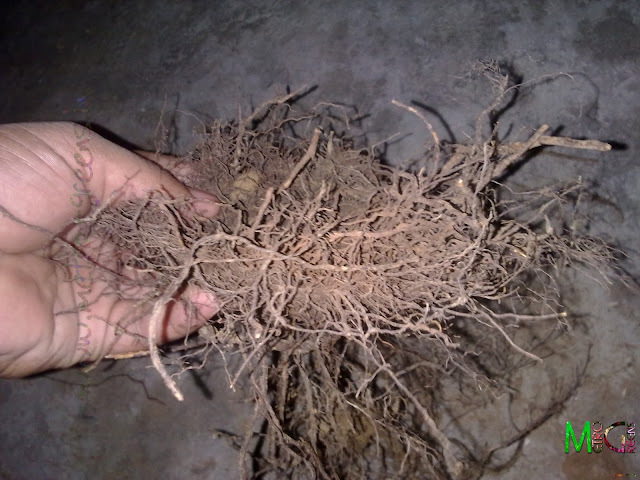 Most of these roots gather at the base of the pot or container your plant is in. 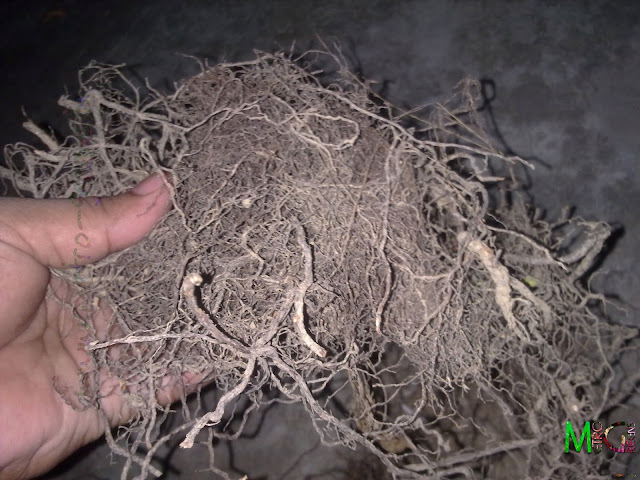 These are root systems of just a bunch of small portulacas in a small earthen pot. Imagine the dense network of roots in some bigger plants. 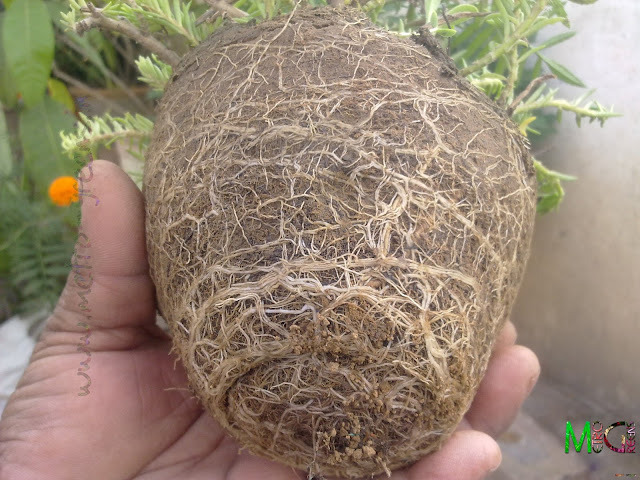 While these roots are necessary, the plant can easily make out without all of these and thus it is quite safe to remove some of these roots, especially those which have gathered at the base of the pot. 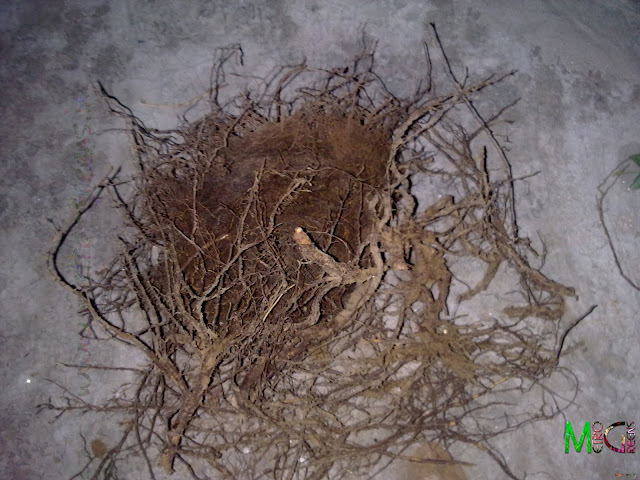 In some cases, the roots do come out of any openings they find in the container, be it a hole in the bottom for outlet of excessive water, or some accidental or intended cracks/spaces. These roots may inhibit the growth of the plant to its full potential and hence I would suggest these roots be removed from time to time. That too, since our containers have a limited space, these roots should be removed from time to time. A simple way to remove these excessive roots is by regularly digging up the soils in the containers and removing whatever roots you're getting. If you could dig a bit deeper, till the very base of the container, you'll hit the jackpot. Don't believe me? Here are the ones I found while doing this exercise for two of my rose plants. The part in the darker shade of brown is a bowl like formation of very fine fibrous roots at the bottom of my pots. There's a possibility that you may damage some important roots of the plants, thus killing your plants. So, please do not attempt if you're not absolutely sure about what I've shown here. If you're doing it, just remove those fine fibrous roots and it'll be fine. If you could somehow get the plant out of its container, it would be much better as this is the only way you'll be able to find the greatest concentration of roots at the bottom of your container. This is one big reason I prefer using earthen pots for planting my plants, as these are relatively inexpensive and using these guarantees that you'll have to change the pots in a couple of years, because these either break down, or get damaged due to washing off water, and thus these earthen pots let me maintain my plants in top shape. I think this would be quite enough for now. I'll be back with some more info about some container gardening with some of my experiences. Till then, keep visiting and HAPPY GARDENING! Labels: Caring for Plants, Caring for rose plant, removing roots.